Hip replacement surgery is one of the most successful orthopaedic operations carried out in this area of medicine. Over 100,500 hip replacement procedures were carried in the UK in 2015. This type of surgery is often required when the joint has become worn out owing to arthritis, weakened or badly damaged in some way and the management of pain can’t be controlled by non-surgical procedures. Hip replacement surgery is a procedure to replace your hip joint with artificial parts (prosthesis) if it’s been damaged or worn away. This damage is usually caused by arthritis, or it can sometimes be from an injury. Your hip is a ball and socket joint. Usually the ‘ball’ at the top of your thigh bone (femur) moves smoothly in the ‘socket’ of your pelvis that’s lined with smooth cartilage. If your cartilage is worn away, the underlying bone is exposed and your joint can become painful and stiff. This can make walking and moving around painful. An operation to give you a new hip joint aims to help improve your mobility and reduce pain. If you have a total hip replacement, the parts of your bones that are rubbing together will be removed. Your surgeon will put replacement pieces made from artificial materials in their place. 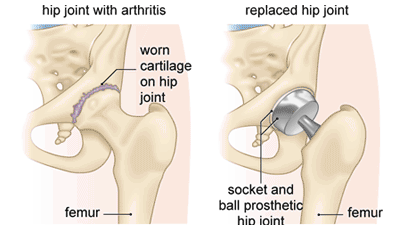 Hip replacements can be made of metal, ceramic or plastic. Hip joints can be fixed (‘cemented’) or pressed into place (‘uncemented’). If the hip is uncemented, the metal surfaces are often treated with a substance and roughened. This encourages your own bone to grow into the artificial joint and fix it in place. 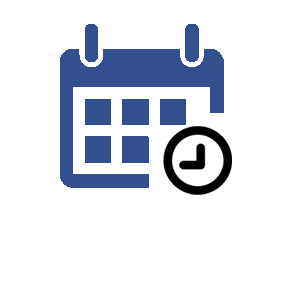 You may also have a hybrid replacement where only one piece is cemented in place. Speak to your surgeon if you have any questions about the type of replacement you’re having. You’ll meet them before your operation to discuss your care. It may be different from what’s described here as it will be designed to meet your individual needs.